InPro designer wall guards provide continious impact protection with strong PVC mount on continuous aluminum or aluminum retainer clips. Minimize seams with standard 12' lengths and 100 standard colors. Provides a continious impact bumber mounted on continious aluminum retainer or aluminum retainer clips. 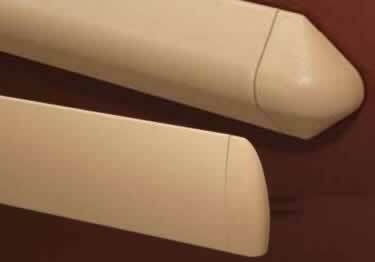 Rubber spacers used to offset wall guards from walls. InPro 1300 Wall Guard looking a this item, my wall is 9' can this be cut? if so with what? InPro® designer wall guards provide continious impact protection with strong PVC mount on continuous aluminum retainer or aluminum retainer clips. Minimize seams with standard 12' lengths and 100 standard colors. Stop damage to corners with surface mount fire rated corner guards. Entire selection of InPro (IPC) colors, styles & models.